Every case is different, so please speak to us about your particular situation. If you want to get a better feel for how we can help, but without incurring any costs, call us free of charge to discuss. Work is generally undertaken on the basis of an agreed hourly rate. Our overheads are low and our prices competitive. There is no textbook approach, and we can discuss a budget before we start. We are happy to be instructed directly by the client or by their solicitor. In the former case we would still work closely with the solicitor, but in an independent capacity. 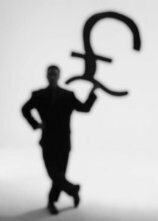 The hourly rates for financial analysis, strategy and divorce consulting are between £200 and £275 per hour plus VAT. The higher rate would apply to complex assignments of significant size. A lower rate of £140 per hour plus VAT may be available for short assignments which are not complex or require only form-filling assistance. Terms and conditions apply. The rates compares to typical solicitor rates of £350 per hour upwards. We can undertake an initial consultation with you, or a preliminary review, at a fixed fee. A preliminary review of your situation, which is necessarily limited in scope, based on your draft or complete Form E, typically costs £500 + VAT. 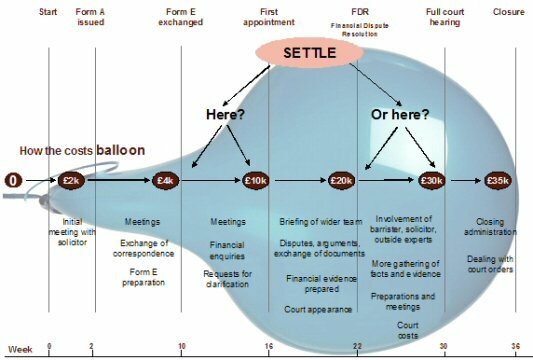 Do you know how the legal costs balloon? Divorce costs rise dramatically when the assets are significant, because both parties understand that it is a worthwhile and important fight. If the fight devolps into a long-term battle the costs rise markedly and the chart below illustrates how legal costs might build up during a divorce case. Costs illustrated here of £35k may not be typical – they could be lower or much higher – but note how the level of costs dramatically accelerates in the later stages, as the time of the solicitor and counsel escalates. Our work is designed to achieve precision in the Form E financial disclosures and to identify early the areas for challenge, defence or further enquiry. An earlier settlement should achieve a dramatic reduction in overall costs.